My friend Miles died of alveolar rhabdomyosarcoma, a rare muscle cancer that tends to afflict young people, six days before he would have turned 19 and three days after I arrived at Carolina to begin my first year. He had been diagnosed with the disease the summer after our sophomore year of high school. Although he rallied to give our graduation speech in May before I came to Chapel Hill, that summer when I was hiking and canoeing in Maine and my other friends were working as lifeguards or waitresses, Miles was dying. She was talking about Miles. Keats was writing about Miles. Sweet Miles, who once told me how he got choked up once on the drive back from chemotherapy, looking out his mom’s car window at the strip malls on the side of the highway. He said he’d never seen anything so beautiful. Miles understood better than anyone I knew the simultaneous omnipresence and ephemeralness of joy. I left the classroom and walked down the third floor hallway of Greenlaw to the staircase. I let myself cry for a couple of minutes, and I thought about Keats and about Miles and about my professor. I remembered how funny Miles could be, how frank and open he was about his disease. I thought about how Keats, writing so long ago, screamed to me through the marked-up page of my Norton Anthology: “I know what you’re going through, Anasa.” I thought about how acutely my professor understood my life, even though to her I was a name on a roster. I wiped the tears from my face and went back to class and continued analyzing Romantic poetry. Later in the semester, when we read Tennyson’s “In Memoriam,” I found the literary bravery to bring up Miles in class, to talk about how once more I was being spoken to by a long-dead British man about my very personal sorrow. I was terrified that my professor would be uncomfortable with my confession — even worse, that she could take pity on me, recommend me to Counseling and Wellness or something. But she did neither. She took my comment for what I intended it to be — an example of Tennyson’s ability to make a poem that was so personal for him so personal for someone else — and she moved on. I wanted to leave class to cry again, I was so thankful that she let me say Miles’ name, that she let me say how much it still hurt. Literature as therapy. Class time as therapy, professors as sensitive and willing listeners. My English 121 class helped me to cope with the death of a friend. I’m grateful to Carolina for so many things, but that — that first autumn when I pretended to be OK, and became OK just by doing my reading assignments — I never expected, and I so appreciate. 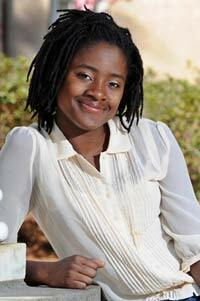 Anasa Hicks ’11, of Bloomfield Hills, Mich., majored in history and minored in creative writing. She will start a doctoral history program at New York University in the fall.